Justice Marilyn Kelly was first elected to the Michigan Supreme Court in 1996. 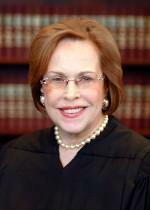 She was re-elected in 2004 and served as Chief Justice from 2008-2011. Her term expired in 2013, and she was age-barred from seeking re-election in 2012. Justice Kelly attended law school at Wayne State University. Prior to that, she obtained an undergraduate degree from Eastern Michigan University and graduate degrees from Middlebury College and La Sorbonne – The University of Paris. Before attending law school, she taught French at Grosse Pointe Schools, Albion College, and Eastern Michigan University, and served on the Michigan State Board of Education. After law school, she opened the practice of Marilyn Kelly and Associates. She was elected to the Michigan Court of Appeals in 1988.